If becoming one of the experts of the sewing process is one of your major objectives, then it is advisable for you to take part in the sewing certification program which you can now easily access at Brainmeasures. You can expect this sewing course offered by Brainmeasures to cover all the aspects linked to sewing including its history. Enrolling in this highly reliable online certification course makes it possible for you to receive a kind of sewing training which works in your attempt to master the steps and procedures that you need to follow when attempting to sew items that are of the highest quality, the different types of sewing, the materials that you need to gather before starting the whole sewing process and the major elements of sewing including stitches and seams. 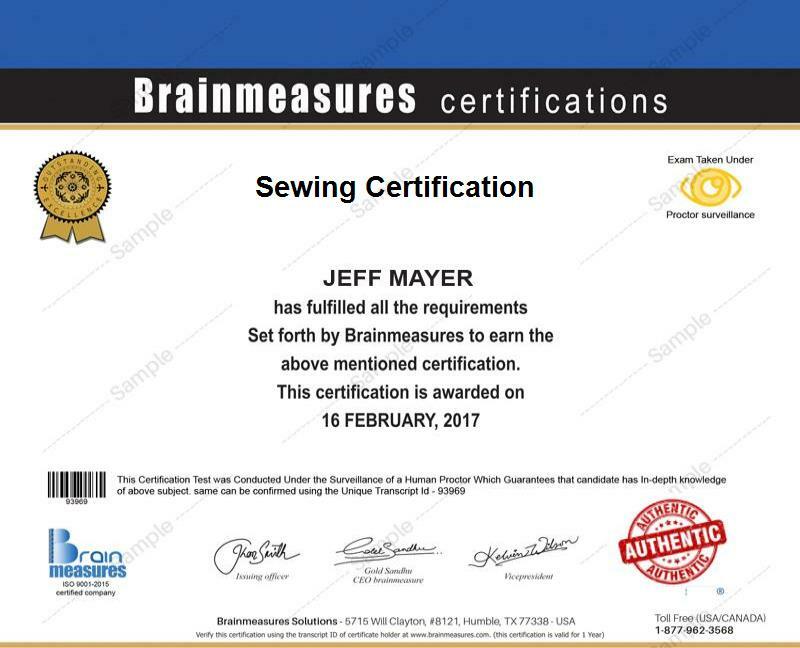 By receiving your sewing certification from Brainmeasures, it will be easier for you to prove to the public that you have highly commendable skills and knowledge in the field of sewing. The sewing certification program which you can now access at Brainmeasures is open to anyone who is greatly interested in sewing. It is perfect for experienced and novice sewists, those who own a sewing or embroidery machine or who want to improve their hand sewing skills and for bag makers, quilters, garment sewists and clothing creators who want to focus on performing their tasks through sewing. Finishing up a sewing certification course is also a major help in getting a more desirable flow of income. With the help of your sewing certification, you have greater chances of becoming an upholstery sewing machinist which has a starting annual pay of $40,000. You may also get the position of a sewing machine operator which allows you to receive around $30,000 to $58,000 annually. Working as a sewing teacher also allows you to enjoy an average annual salary of $68,000.